Rep. Ilhan Omar might not be where she is today had President Donald Trump been in office when she tried entering the United States. 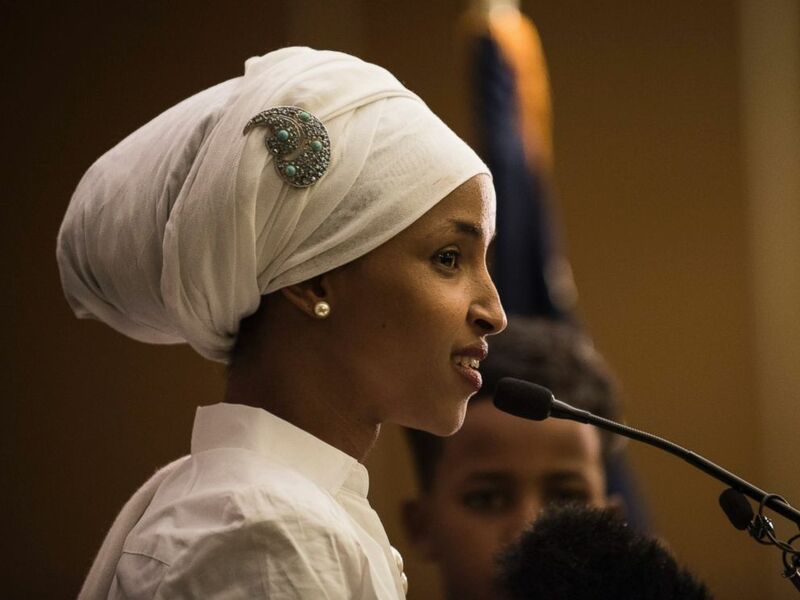 Born in Somalia, Omar spent four years of her childhood in a Kenyan refugee camp before eventually moving to the U.S. Now, she's the first Somali-American Muslim woman to hold public office in the U.S. as a legislator in the Minnesota House of Representatives. Minnesota is home to the largest Somali-American population in the U.S. Nearly one in three Somali-Americans -- roughly 25,000 people -- live in Minnesota, according to the latest figures from the U.S. Census Bureau. That includes U.S. citizens and their children as well as more recent arrivals. 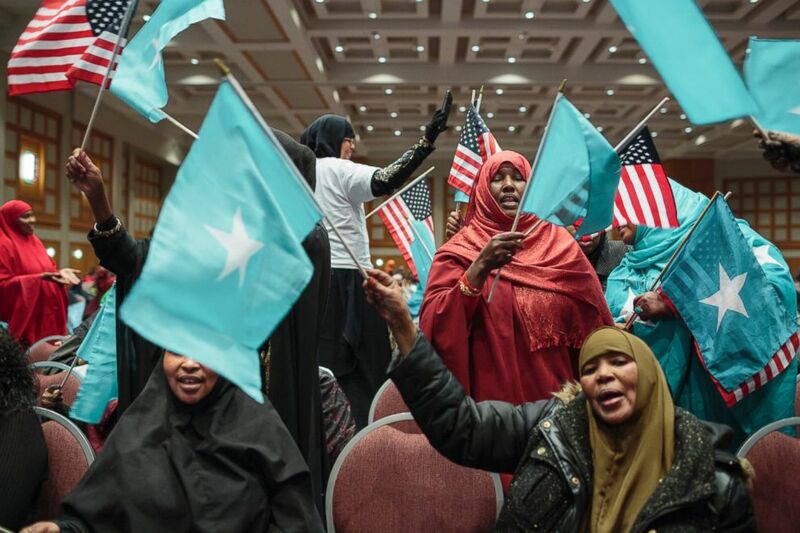 Omar described the Somalis in Minnesota as a "vibrant, diverse, hard-working and resilient.” But Trump's efforts to bar Somalis from entering the U.S. have become a growing source of frustration and hardship among members of this tight-knit community. Somalia, a country in the Horn of Africa that has been plagued by war, drought and famine, has been included in both versions of Trump's executive orders on immigration. The revised order, issued earlier this month, temporarily bans the entry of people from six Muslim-majority nations -- Somalia, Sudan, Yemen, Iran, Libya and Syria. Iraq was included in the initial version issued in January, but the country was removed from the revised version. Federal judges in Hawaii and Maryland have since blocked Trump's revised travel ban from taking effect, and the legal fight is headed to the appeals courts. Omar told ABC News that she, along with many other Somali-Americans living in Minnesota, strongly opposes the president's travel ban, calling it "unconstitutional." She described Trump's desire to isolate the Muslim-majority nations in the executive order as "baffling." Top advisers in the Trump administration said of the original executive order that the countries highlighted were previously identified by the Obama administration as "countries of concern," due to their history of ties to terrorism. In February 2016, during President Barack Obama's final year in office, the Department of Homeland Security added Libya, Somalia and Yemen as "countries of concern" to an existing list that already included Iraq, Iran, Sudan and Syria. This list limited "Visa Waiver Program travel for certain individuals who have traveled to these countries since March 1, 2011." Trump's revised travel ban, signed on March 6, features language specific to Somalia, explaining why it was included on the list of banned countries. "Portions of Somalia have been terrorist safe havens. Al-Shabaab, an al-Qaeda-affiliated terrorist group, has operated in the country for years, and continues to plan and mount operations within Somalia and in neighboring countries," the executive order states. "Somalia has porous borders, and most countries do not recognize Somali identity documents. The Somali government cooperates with the U.S. in some counterterrorism operations but does not have the capacity to sustain military pressure on or to investigate suspected terrorists." There have been cases of Somali-Americans attempting to commit acts of terror on U.S. soil. For instance, Mohamed Osman Mohamud was the target of a six-month FBI sting in 2010, in which he allegedly believed he was detonating a bomb inside a parked van at a Christmas tree lighting in Portland, Oregon. Mohamud, who was 19 at the time of the incident, is currently serving a 30-year sentence in federal prison in California. A group of students gather at the Somali mall, otherwise known as Karmel, in Minneapolis, Feb. 20, 2017. 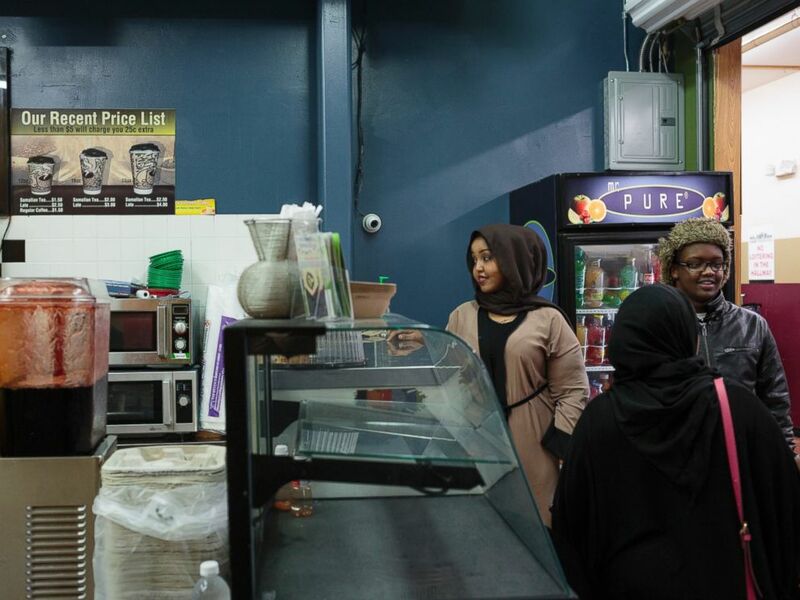 Karmel attracts many individuals from the Somali community, offering a hub of local foods and home to over 200 vendors. Omar sees individuals like Mohamud as the exception and not the rule. 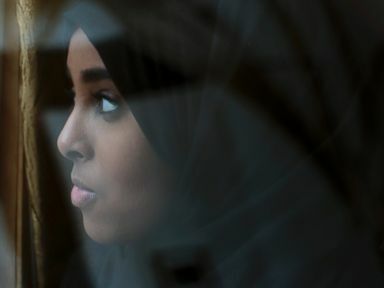 She said many of her Somali neighbors in Minnesota came to the U.S. in part to escape the frequent bombings and attacks by Al-Shabaab -- not to commit them. "We see terror as a threat to ourselves," Omar said. "If you ask a Somalian -- we are fighting to cut off the cancer of terror from our own lives." Decades of civil war and political instability have ravaged much of Somalia’s economic infrastructure, government structure and institutions, according to the World Bank. Clan warlords battling for power carved up the East African country following the collapse of a military dictator’s regime in the early 1990s. After years of interim authority, an internationally backed federal government was installed in 2012. Last month, Somalia elected its first president in decades: Mohamed Abdullahi Farmajo, a former prime minister and dual Somali-U.S. national whose victory has offered a ray of hope. So far, the federal government has failed to assert central authority over the entire nation which, combined with high youth unemployment, has created a niche for piracy and armed groups, such as Al-Shabab. Al-Shabaab, whose name means “the youth,” emerged in 2006 from the now-defunct Islamic Courts Union, which once controlled Somalia's capital of Mogadishu. 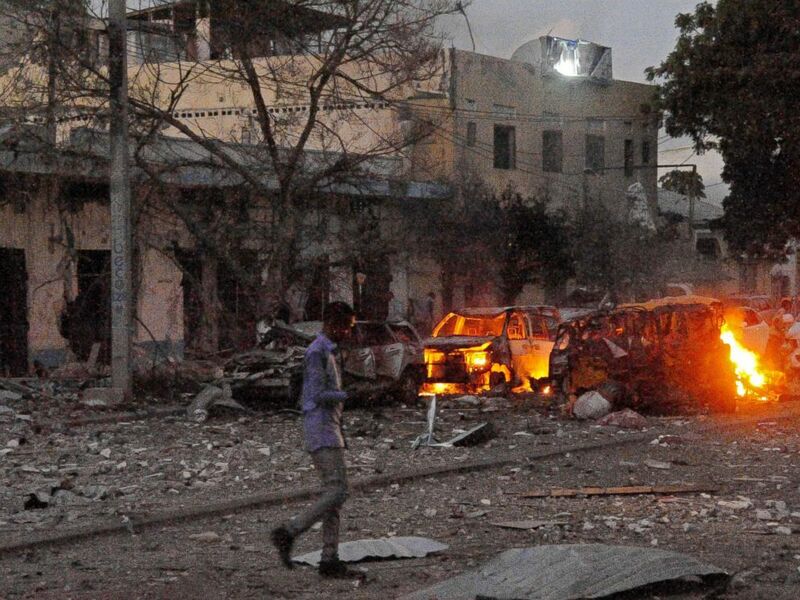 The Sunni extremist group launched its own insurgency on major cities in Somalia in 2009, seizing Mogadishu and much of southern Somalia until it was pushed out by domestic and international forces around 2012. Although the group lost control of most cities and towns, Al-Shabaab continues to dominate in many rural areas of southern Somalia and is reportedly becoming increasingly present in the northern region. A man walks past the scene after a car bomb exploded, June 1, 2016, outside a Mogadishu hotel that houses several MPs, killing several people, and followed by a gun battle. The conflict, coupled with a lack of access for aid workers, has made it difficult to deliver food assistance during times of drought. The ongoing drought in the Horn of Africa region, exacerbated by the strongest El Niño on record, has triggered an increase in food insecurity and malnutrition. Although the weather phenomenon is considered to be over, the region is still reeling from its effects, and the situation is especially dire in Somalia, which earlier this month declared the persistent drought a national disaster. Over 6 million people in Somalia -- more than half the country’s population -- are in need of aid, including food, water and sanitation, as well as protection and shelter, according to recent figures from the United Nations. Humanitarian agencies on the ground report the situation has begun to look increasingly similar to Somalia’s 2011 famine, in which over 250,000 people died, according to a recent press release from the International Organization for Migration. Some rural communities were still struggling to recover when the next wave of drought struck. If the situation in Somalia burgeons into a full-blown famine, the World Health Organization said it would be the nation’s third famine in a quarter of a century, and the second in less than a decade. The U.N. has urged global action to save people in Somalia from starvation. But the United States, which has historically been generous and immediate in providing foreign aid, has yet to respond. The Trump administration recently unveiled a blueprint budget that proposed beefing up defense spending and slashing funds for U.S. diplomacy and foreign aid. This includes cutting the budget of the Department of State and U.S. Agency for International Development (USAID) by 28 percent, which means less development aid and less support for U.N. programs. 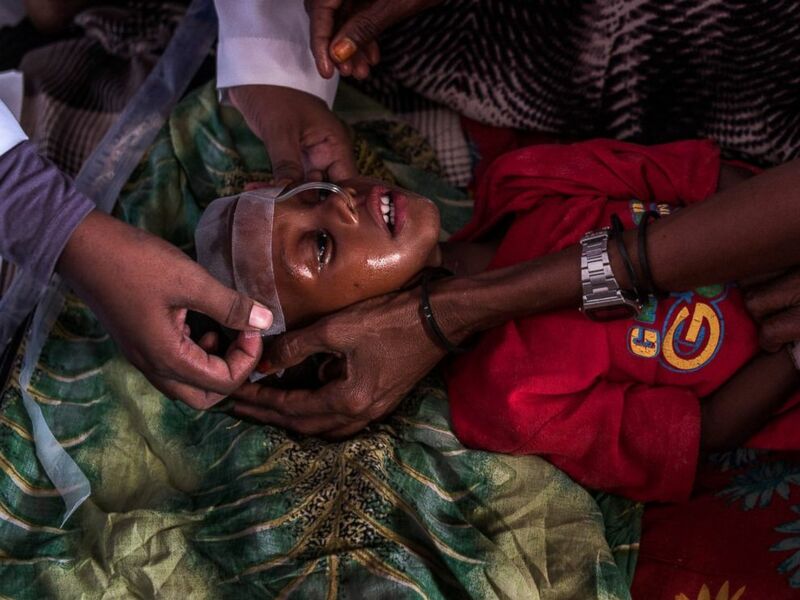 Medical staff treat a child suffering from malnutrition at Garowe General Hospital, Feb. 27, 2017, in Garowe, Somalia. Trump’s revised travel ban, currently blocked by two federal courts, has stifled the hopes of many Somalis wishing to come to America for a better life. Nuur Abdullahi, a 21-year-old medical student in Mogadishu, is among them. Bisharo Ali Hussein, a 27-year-old Somali national studying international gender studies in Iceland, said Trump’s travel ban is the “wrong approach” to preventing terrorism both at home and abroad. Hussein, who is from Galkayo, the capital of Somalia’s north-central Mudug region, said Somalis are now seeking a better life across borders in Africa rather than overseas in America. Omar, the youngest of seven children, lost her mother at a young age. After spending four years in a refugee camp in Mombassa, Kenya, her family found a U.S. sponsor and moved to Virginia before settling in Minnesota’s capital city in 1997. Today, the 34-year-old mother of three is a member of the Democrat-affiliated Minnesota Democratic-Farmer-Labor Party and is the newly elected Minnesota House Representative for District 60B. She said Trump’s inclusion of her home country in the controversial travel ban is based on misconceptions about Somalia and its people. "One common misconception about Somali immigrants is that we are a burden on the taxpayer," Omar said. "People are ignorant of the way we positively contribute to society. But if you come to Minnesota, you will see that we are doctors, nurses, small business owners." 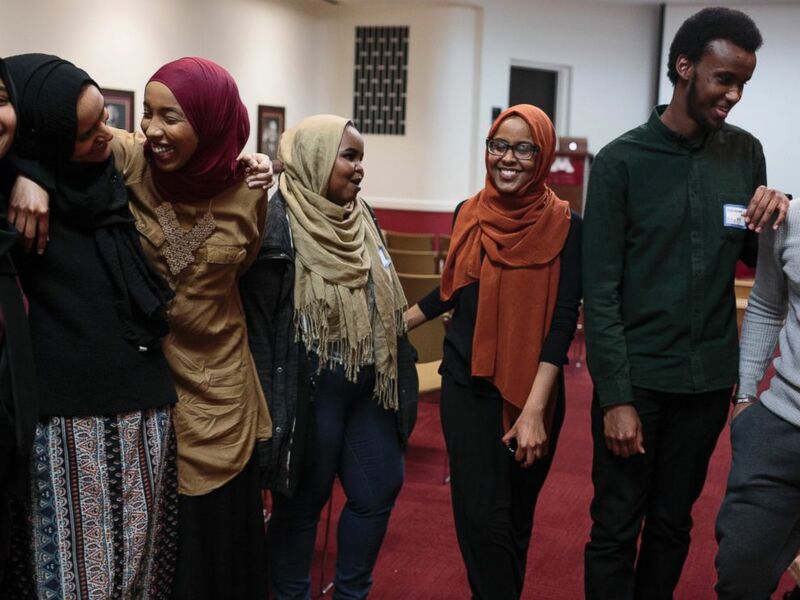 The Somali Student Association hosts an event at the University of Minnesota campus, Feb. 23, 2017, Minneapolis. The event marks the anniversary of the Ogaden massacre that took place in 1994. Somalia's struggles, combined with Trump's attempts at implementing a travel ban, have put a strain on members of this Minnesota community. Mohamud Noor, a Somali-American computer scientist, activist and politician, told ABC News that Somalis in Minnesota have raised upward of $40,000 this month alone to help millions facing hunger and starvation in Somalia. Noor, who is the executive director of the Confederation of Somali Community in Minnesota, said these life-and-death situations are more pressing to Somalis than Trump's executive orders. Still, he said, the president's policy moves are frightening for those who have family members facing dire conditions halfway across the world. Somalis in Minnesota feel it's too much of a risk to visit their loved ones in need, according to Noor. “People are fearful if they leave their country they might not come back,” he said. Editor's note: This story originally stated that Omar represented one of Minnesota's eight congressional districts. She is in fact a member of the Minnesota House of Representatives.